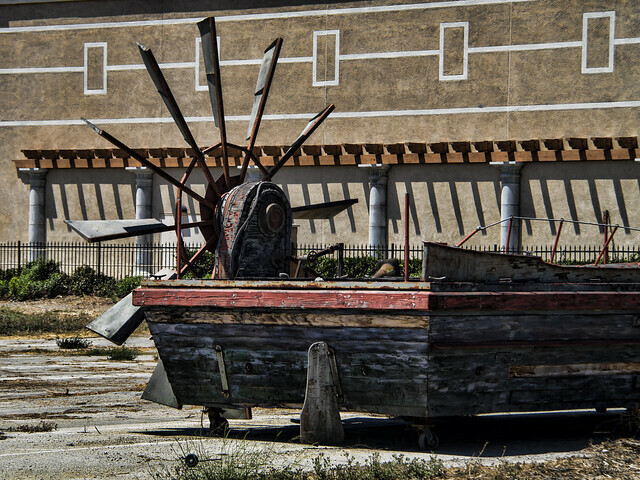 What are an old paddle wheel and part of a river boat doing in the middle of a nearly empty lot miles from the nearest river? This is the backlot of what used to be Downey Studios. The company is gone now, and the buildings are being dismantled. The residential street that I recognized in a scene in Christmas with the Kranks is demolished. But this paddle wheel, which was turning freely in the breeze, remains. I wonder what they're going to do with it. I think it would look great in my back yard. The paddle wheel that you show may have been a windmill: there were a lot of them on towers in the old farm homesteads, used mainly for pumping water I think. The Rives Mansion has such a tower. Anyway, thanks for your wonderful blog. Thanks, Yankee, I'm glad you're enjoying our blog! My first thought was a windmill, too. I Googled it ("what is that big wheel thing in the back lot of downey studios") and it came up with a Wikipedia article with a labeled picture. But who knows?